Here in New England, the weather is always frightful. Either it’s a blistering 90°+ in the summer time, with humidity so thick that you can spoon it into a tupperware and save it for lunch, or it’s a frigid cold that makes you wish in vain for a handy tauntaun, whose belly you can curl up inside for warmth. But the change from hot to cold signals that winter is underway and that the holidays are fast approaching. Or have already gone by. Winter’s long around here, okay? As we continue our ramp up to the holiday season, we have a trio of terrific tantalizers on this week’s Gadgetbox. Variations on an old weaponry fave, the perfect tool for dealing with those inevitable frustrating packages, and the latest in ice-scraping technology. A USB-powered missile launcher is, frighteningly enough, nothing new under the sun. Once the Cold War ended and the Soviet Union and United States began decommissioning warheads, it was only a matter of time before these things found their way off the black market and into cubicles around the world. But with their return to prominence, it was only a matter of time before escalation began afresh. It’s not sufficient to have a USB device that fires missiles…when you can have a USB device that fires missiles and has a detachable webcam. Or can fire missiles without being limited by the length of that pesky USB cable. In fact, we bet it’s only a matter of time before you’ll be able to buy a USB-powered submarine that fires intercontinental foam missiles on a polar trajectory. The webcam version was co-developed by Microsoft, and you know they know a thing or two about wholesale destruction and scorched earth policies. While these missile launchers may not be ready in time for the holidays—they’ve yet to show up on the vendor’s website—word is they’ll be on hand at the Consumer Electronics Show in January, so I’ll recon them there and give you a full sitrep. 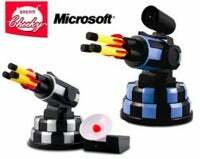 While prior versions of the missile launching technology were not compatible with OS X out of the box, an intrepid third-party developer has stepped in to fill the void; we can only hope he brings his powers to bear on these new additions to the foam arsenal. You know what the worst part of the holiday season is? Nope, it’s not Uncle Ralph having one too many eggnogs or Auntie Glenda tweaking your cheek and asking why you’re not married yet; it’s those bloody plastic blister packs—the operative words being “bloody” and “blister.” If you, like me, have one too many battle scars from waging war upon these diabolical contrivances, then it’s time to look for a solution. The Plastic Surgeon may be the answer to our fervent prayers. This $9 knife has—appropriately—a surgical-grade steel blade (just in case you need to perform an improvisational appendectomy), an ergonomic design, and a plastic for added safety (to avoid accidentally performing an improvisational appendectomy). It cuts blister packs to shreds while letting you keep your hands in one piece. According to the Gizmodo folks, who gave the Plastic Surgeon a try, it works on pretty much all kinds of clamshell packages. And, better yet, it comes in a package with a cardboard back instead of its own blister pack, preventing those dangerous chicken-and-egg conundrums that could destroy the space-time continuum. As I mentioned up top, it’s finally getting cold outside. Yesterday morning, I came out to find that it had rained overnight, followed by a severe temperature drop, meaning my car was covered in a solid sheet of ice. I managed to shoo away the squirrels strapping on their skates just in time. The $20 IceDozer Plus claims to be that next stage of ice-scraping evolution, featuring ergonomic handles, a removable brush, and a patented Flexiblade that conforms to the shape of your windshield. There’s even an Ice Notch to make it easy to remove the ice from your windshield wipers—crucial for safe driving in these chilly climes. Not to mention my favorite feature: a special “no tears” formula. Well, the cold weather’s awaitin’ me outside. I’m considering hibernating for the rest of the winter, but I hate to leave you all without the weekly Gadgetboxing that you love, so I’ll see you next week.